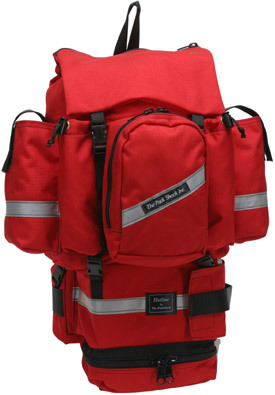 Detachable gear bag with 2100 cubic inch capacity. Side-opening fire shelter pouch (also available with left-handed opening) designed to hold either old-style or new style fire shelter. Two fusee pockets hold 2 fusees each. Two (1.0 L) water bottle side pockets w/straps. Zippered accessory pouch on top. Zippered accessory pouch below fire shelter. 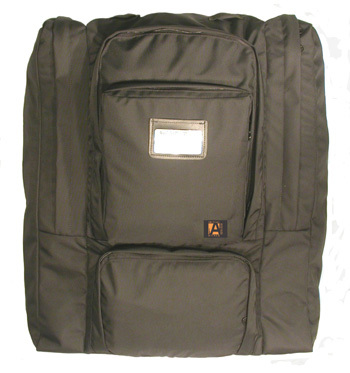 Zippered compartment located on rear. Padded, fully adjustable, waist belt and shoulder straps. Space on waist belt and shoulder straps for accessory pouches. Internal pouch for compartmentalization or water bladder. Replacement main bag and replacement harness also available by special request.